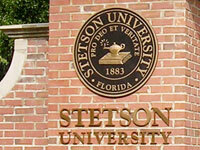 The Distinguished Alumni Award is presented annually to up to four Stetson University alumni who, through outstanding achievement in their lives and professions, have brought distinction and special recognition to Stetson University. 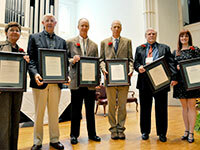 Click on the dates below to view award recipients and their bios. Julia Nesheiwat graduated from Stetson in 1997 with a B.A. in Sociology and Religious Studies. She is currently the Presidential Deputy Envoy for Hostage Affairs. Working closely with the families of American hostages, foreign governments and the interagency Hostage Recovery Fusion Cell, she represents the United States on hostage-related issues. Previously, she was appointed as Deputy Assistant Secretary of State for Implementation in the Bureau of Energy Resources. She also served as a Political-Military Advisor and Visiting Professor at the U.S. Naval Post Graduate School’s National Security Affairs Department. She has held number positions as Chief of Staff and Senior Advisor to the Under Secretary for Economic Affairs and U.S. Special Envoy for Eurasian Energy Security. Earlier in her career, she served as the Chief of Staff for Policy and Planning in the Office of the Director of National Intelligence, where she managed the integration and collaboration of analysis and reporting with all intelligence agencies. Prior to that role, she was selected to serve on the U.S. Presidential Commission on Intelligence Capabilities Regarding Weapons of Mass Destruction, leading the North Korea and Iran policy steering committee from 2004-2005. A former U.S. Army Military Intelligence officer, Dr. Nesheiwat served consecutive tours in Afghanistan and Iraq. As a senior operations officer, she coordinated and managed interagency assessments on terrorist networks within the Middle East and Asia, and acted as the U.S. military liaison officer with regional political parties on governance and threat reduction. Dr. Nesheiwat was an International Affairs Fellow with the Council on Foreign Relations and on the Governing Advisory Council for the World Economic Forum. She earned a Ph.D. from Tokyo Institute of Technology in Japan; an M.A. in security studies from Georgetown University, Washington DC; and a B.A. in religious studies and sociology from Stetson University in Florida. She is a fluent Arabic speaker. Chuck Wolfe has devoted his public service and political career to moving the nation forward on some of the biggest issues of the day. From electing gays and lesbians to public office to preventing youth access to tobacco, Wolfe's leadership has been critical to the success of these efforts. Chuck is President and CEO of the Gay & Lesbian Victory Fund and Institute, which identifies, trains and supports openly lesbian, gay, bisexual and transgender candidates, campaign staff and public officials. The Victory Fund has grown fivefold during Wolfe's tenure and accomplished many firsts, including supporting a record 255 candidates in the 2012 cycle and seeing the first openly gay member elected to the U.S. Senate. Leopoldo "Leo" Fernandez Pujals earned his B.B.A. in Business Administration in 1973. A year after the Castro revolution, when he was 13, his family went into exile in Miami. He entered the Marines in 1968 and went on to fight in Vietnam. He began his career with Proctor and Gamble and continued with Johnson & Johnson before starting a pizza company, Telepizza. He later sold the pizza company and at present has controlling interest of Jazztel, a full telecommunication service provider. Alethea Bonello earned her B.A. in Social Science in 1998. She went on to get her M.A. in Public Administration from Georgia State University in 2006. She was also a part of the 2008 inaugural class of Leadership Stetson. Alethea has been involved with the NAACP since 1989, holding various NAACP positions including State Youth President of Florida, Regional Youth Chairwoman, and National Youth Work Representative. She has received numerous awards, including the Juanita Jackson Mitchell Award, Gloster B. Current Award, ﬁrst place in Poetry at the National ACT-SO competition, and the Young Women in NAACP award. Alethea joined the NAACP national staﬀ in 1998 following her graduation from Stetson and has served as Branch Liaison, Branch Operations Manager, and Regional Youth Field Director for the Southeast Region. She was bestowed with the Torch of Peace Award from Georgia State University in 2006 and was named one of ten Outstanding Young People of Atlanta in 2006. In 2008, she received the Medgar Evers Staﬀ Award of Excellence and the Jondelle Johnson Legacy Award. In 2012, she received a commendation from the Georgia General Assembly for her work in civil rights. She currently serves as the Southeast Region Field Director of NAACP, implementing multi-faceted advocacy campaigns on key issues, and training and mobilizing units, members and stakeholders to advance the association’s strategic goals and objectives for the seven-state region. She is also pursuing her doctoral degree at Oxford Graduate School, studying social research and the integration of religion and society. Todd DuBosq received his B.S. in Physics in 2001. He went on to earn an M.S. and Ph.D. in Physics at the University of Central Florida. In 2004, his research earned him the UCF College of Arts and Sciences Outstanding Master’s Thesis Award. His dissertation on landmine detection in conflict and demilitarization zones demonstrates the potential application for eradicating these harmful devices, preventing further injuries and casualties. He is currently working at the U.S. Army Night Vision and Electronic Sensors Directorate just outside Washington, D.C. Todd’s research is used to provide American soldiers with the night-vision technology they need to carry out their missions. He has authored seven refereed journal publications and presented his research at 31 conferences, workshops and research forums internationally. Todd represents the U.S. Army as a subject matter expert and group chairman on the topic of computational imaging and compressive sensing performance assessment for electro-optical and infrared systems for NATO. The NATO committee he currently leads is made up of representatives from France, Germany, the United Kingdom, the Netherlands, Belgium, Turkey and the United States. In 2014, he was chosen for a highly selective one-year assignment to represent the U.S. Army as an exchange scientist to the Fraunhofer IOSB in Germany. Since 2004, he has served on the Board of Directors of Kappa Hexaton Scholarship Foundation, Inc., the alumni organization for Stetson’s Phi Sigma Kappa chapter. Todd also volunteers at local Title I elementary schools teaching optics science lessons to help young students develop an appreciation for science. Robert “Bob” Moore graduated from Stetson with a B.A. in History in 1963. After serving in the U.S. Army and earning the rank of 1st Lieutenant, he went to law school and then was admitted to the Florida Bar in 1968, retiring in 2014. His awards include: South Venice Rotary Club Distinguished Community Service Award; Honorary Member of Rotary International; Sarasota County Bar Association Distinguished Community Service Award; Laurel Civic Association Man of the Year Award; Champion of Change, awarded by the White House in 2012 for work with UNICEF and the Kiwanis Iodine Deﬁciency Project; Pillar of the Community Award from City of Venice; and many others. He is a charter member of the South Venice Baptist Church. Bob served as vice chair of the Worldwide Service project charged with leading the Kiwanis International effort with UNICEF to eliminate iodine deficiency disorders (IDD). The project has been called the most successful public/private partnership to virtually eliminate a known health problem; today, some 80 million children each year are born without the threat of IDD. At Stetson, “N.K.” helped create CHOMI-RAFIKI, a thriving microcredit program in Tanzania. Now a program director at The Jane Goodall Institute in Tanzania, he is also one of the founding members of Jane Goodall’s Roots & Shoots, a global environmental and humanitarian program for young people. While in the United States, he was instrumental in setting up Roots & Shoots clubs, especially in Florida. N.K. also teaches environmental art to young people and is the founder and executive secretary of the Dar Art Youths (DAY) art group. Since 1998, he has been involved in coordinating various initiatives that demonstrate care and concern for the human community in Tanzania. An English major, Anne earned a Master of Public Administration from Harvard’s Kennedy School of Government and studied Mandarin Chinese at the Yale-in-China Center in Hong Kong, SAR. Now the senior advisor for science and technology policy at The Center for Study of Presidency & Congress, Anne focuses on foreign policy and economic and security implications of science and technology globalization. In the mid-1990s, Anne served as Deputy Assistant Secretary for Science, Technology and Health at the Department of State, overseeing U.S. bilateral and multinational science and technology ties, international health initiatives and civilian and commercial health space activities. She began her career at the National Academy of Sciences and also worked with the Carter Administration, where her responsibilities included developing the first U.S.-China science and technology agreement. She is a member of the Council on Foreign Relations, the American Association for the Advancement of Science, and the National Committee on US-China Relations. Frank Farmer, BA ’64 (History), of Ormond Beach, Fla., is the medical director at Covance in Daytona Beach. He earned an M.A. and Ph.D. in History from the University of Georgia, as well as a medical degree from the Medical College of Georgia in Augusta. Frank has served as a battalion surgeon in the Florida National Guard, as a flight surgeon, a bioterrorism consultant to the Air Force, and as commander of the 919 Special Operations Medical Group. He retired from the Air Force with the rank of Colonel in 2004. Prior to medical school, Frank served as an Army captain in Vietnam and is a recipient of the Bronze Star and the Vietnamese Cross of Gallantry. Frank has also served as president of the Florida Medical Association and on the Board of Governors for the American College of Physicians, Florida Chapter. Appointed by Governor Rick Scott to serve as the Florida State Surgeon General, he also chaired the Florida Board of Medicine, where he is a current board member. Kaye Wachsmuth, BS ’66 (Biology), of DeLand, Fla., is an international public health consultant. 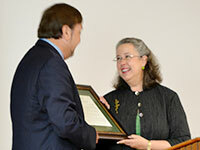 She earned her doctorate in Microbiology from the University of Tennessee, Knoxville. In 1972, Kaye joined the Centers for Disease Control and Prevention in Atlanta, where she served as deputy director of the Division of Bacterial and Mycotic Diseases and chief of the Enteric Disease Laboratory Section. She then became deputy director for programs at the FDA’s Center for Food Safety and Applied Nutrition before becoming the first deputy administrator of the Office of Public Health and Science in the USDA’s Food Safety and Inspection Service. She was also chief technical advisor for the Food and Agricultural Organization and World Health Organization project to improve food safety management in Vietnam, Lao PDR, and Cambodia. She has served both nationally and internationally, chairing the Codex Alimentarius Committee for Food Hygiene, the National Advisory Committee on Microbiological Criteria for Foods, and on many other boards and committees. Today Kaye is an independent consultant, primarily to the FAO in Rome and the WHO in Geneva. Chris K. Brigham '77 (marketing), of Roxbury, Conn., is an executive producer in the motion picture industry. Chris' career in the film industry began in 1983 when he worked as a location assistant for the movie Easy Money, starring Rodney Dangerfield. Chris has held the positions of associate producer, co-producer and executive producer from 1995 the to present. His work as producer includes numerous box office hits, such as The Mummy: Tomb of the Dragon Emperor, with Brendan Fraser; The Good Shepherd, with Angelina Jolie and Matt Damon; The Aviator, with Leonardo DiCaprio; Analyze This and Analyze That with Robert DiNero and Billy Crystal; The Count of Monte Cristo, with James Caviezel; The Legend of Bagger Vance, with Will Smith and Matt Damon; Before and After, with Meryl Streep and Liam Neeson; Extreme Measures, with Hugh Grant; and Kiss of Death, with Samuel L. Jackson and Nicholas Cage; Interview with a Vampire, with Brad Pitt and Tom Cruise; Six Degrees of Separation, with Will Smith and Donald Sutherland; Lorenzo's Oil, with Susan Sarandon and Nick Nolte; and Born on the Fourth of July, with Tom Cruise. Chris is an executive producer on the recently released film Argo, starring Ben Affleck, and Christopher Nolan's award-winning and thought-provoking dramas Inception and Shutter Island, both starring Leonardo DiCaprio. He is also executive producer for Noah (due out in 2014), starring Emma Watson and Russell Crowe. Richard "Rich" W. Cheston '79 (chemistry and business/management), of Pittsboro, N.C., is chief technical architect, distinguished engineer and master inventor at Lenovo. Rich has been in the PC industry almost from the beginning (1982) and has held key areas of responsibility worldwide, first within IBM and now within Lenovo, such as product strategy, marketing and new product development. Rich spent 23 years at IBM and achieved the status of Master Inventor and in 2004 was appointed a Distinguished Engineer for sustained technical leadership. Rich is recognized worldwide for his insight from technology companies like Intel, customers like The Coca-Cola Company, to the leading technology analyst group, Gartner, where he was active in the development of Gartner's original Total Cost of Ownership model (TCO). Rich is one the most sought after speakers consistently presenting to customers and at major technology shows over 100 times a year. Rich's passion has been working directly with corporate customers and developing new manageability solutions. In fact, he has around 70 patents or patents pending between his time at IBM and Lenovo. In addition, Rich was the original creator of what has become the industry standard for remotely waking a PC: Wake-On LAN. In 2005 Lenovo purchased IBM's PC Division and Rich choose to join this new organization. Over the next 7 years, Lenovo has grown from a Chinese only company to the world's largest personal computer company. In 2010 Rich was named Chief Technology Architect for Lenovo's Software & Peripherals Group and today, Rich is leading Lenovo's Cloud strategy. Rich and his wife, the former Laura Duke '81, received the U.S. Department of Agriculture's, "Outstanding Stewardship Forestry" award in 2009. Shirrel Rhoades, BA '64 (Art), of Key West, Fla., has enjoyed a successful career as a writer, publisher, entrepreneur, filmmaker, and philanthropist. Prior to retiring in 2005, he was vice president for business development for the Reader's Digest Association, Inc. He was publisher of a number of Reader's Digest books, including Medical Breakthroughs and The Healing Power of Vitamins, Minerals and Herbs. In 1996, he was appointed executive vice president of Marvel Entertainment and publisher of Marvel Comics. Earlier in his career, he was the associate publisher of Harper's Magazine. He also served as vice president of consumer marketing for Charter Publishing, which at the time, published Ladies' Home Journal, Redbook, and Sport magazines. Rhoades joined Scholastic, Inc. as vice president to launch Family Computing magazine in 1988. He then purchased his own publications aimed at small business entrepreneurs, Opportunity Magazine and Income Plu$. Books written by Rhoades include Magazines: A Complete Guide to the Industry (with Dr. David E. Sumner), Comic Books: How the Industry Works, and A Complete History of American Comic Books. He is the author of more than 500 bylined feature articles published in popular magazines, as well as hundreds of other essays on history, book reviews, and film critiques. Rhoades has served on the board of directors of American Family Publishers and on the advisory board of the New York Academy of Sciences. During the 1980s, he was chairman of the Consumer Marketing Committee for Magazine Publishers of America. His marketing campaigns have won numerous industry awards. He was inducted into the FMA Hall of Fame in 2012. The FMA is a professional association of executives involved in the magazine publishing and circulation business. V. Inez Archibald has had a distinguished career in public service and spiritual leadership. Her educational background includes a Master of Arts degree in Religious Studies from Stetson University, which she earned in 1985. She also holds a bachelor's degree in Economics and Business Administration from Rollins College, and a Master of Divinity degree from Emory University. Originally from Tortola's West End, British Virgin Islands (BVI), Inez currently serves as Deputy Governor of the Virgin Islands, a post she has held since 2008. She made history in 2003 when the 15th Legislative Council appointed her as the territory's first female Speaker of the House, a position she held until 2007. Inez served as Acting Governor in 2009. In addition, she is founder and director of J.S. Archibald Trust Services Ltd., the corporate and trust arm of J.S. Archibald & Co., and serves as Managing Director of Jipfa Investments Ltd.
Inez is a former member and chairwoman of the BVI Public Service Commission, and former member of the BVI Judicial and Legal Services Commission, the BVI Income Tax Appeal Board and the Family Support Network Board. She is active in the Methodist Church in the Caribbean and the Americas. Inez served as Chief Executive Officer of J.S. Archibald & Co., one of the oldest and most prestigious legal firms in the BVI and the Caribbean. Her early career was spent in the banking industry, first with the Virgin Islands National Bank and then the National Mid Atlantic Bank/Bank of America in St. Kitts. Laurette Koellner served as President of Boeing International and Senior Vice President of The Boeing Company until her retirement in 2008 following a distinguished career spanning 30 years in the aerospace industry. Laurette earned her Master of Business Administration degree from Stetson University in 1980 after receiving her bachelor's degree in Business Management from the University of Central Florida in 1977. She began her career in the aerospace industry in 1978 when she joined McDonnell Douglas as an analyst. She moved quickly into positions of increasing responsibility at McDonnell Douglas, and subsequently at Boeing after those companies merged in 1997. Laurette's career at the Boeing Company includes a seven-year membership in the company's senior executive leadership team. In her most recent Boeing position as President of Boeing International, she oversaw the company's international affairs, with leadership responsibility for 20 Boeing organizations throughout the world. Prior to this, from 2004-2006, she was President of Connexion by Boeing, the former Boeing business providing leading-edge, high-speed connectivity services to aircraft and maritime vessels via a sophisticated network of global satellites. During a multi-disciplined career, primarily in finance, Laurette served as Executive Vice President and member of the Office of the Chairman of The Boeing Company and in a variety of diverse roles including Chief Administration Officer and Chief Human Resources Officer. A recognized financial expert, Laurette is an independent Director of American International Group, Inc. (AIG), and serves as Chairman of AIG's Regulatory and Compliance Committee and as a member of its Compensation Committee. She also serves on the Board of Directors of Sara Lee Corporation and Celestica, Inc.
Laurette is a member of the Council on Foreign Relations, serves on the University of Central Florida College of Business Dean's Executive Council and is a member of the Midwest Audit Committee Network sponsored by Ernst and Young. Tom Reis is an accomplished artist, who graduated with a Bachelor of Arts degree from Stetson University in 1988, and a Master of Fine Arts degree from the San Francisco Art Institute in 1993. A double major in Art and Spanish at Stetson University, his coursework led him to a study-abroad experience in Madrid, Spain. During his time in Madrid, he lived on the same street where one of his most important artistic influences, Spanish realist and impressionist Joaquin Sorolla y Bastida (1863-1923), had lived years before. Tom also credits portrait painter John Singer Sargent (1856-1925) as having a significant influence on his own painting style, which Tom describes as "traditional realism influenced by American impressionism." Tom's illustrations have appeared in TIME, Rolling Stone, Sports Illustrated, Forbes, Business Week, Golf Magazine, Barron's, The Wall Street Journal and several other nationally known publications. His oil paintings of people, places and moments in time have been exhibited from New York City to San Francisco to Central America. In fall 2010, they were on exhibit at the Museum of Arts & Sciences in Daytona Beach, and at the Marietta Museum of Art in Georgia. His painting, "Red Hat," was featured on the cover of the Fall 2010 issue of Stetson University's SU Magazine. Tom's career is a blend of art and business. An undisputed successful professional in a highly competitive field, Tom acknowledges that his success "is built on a liberal arts education." His paintings are represented in many permanent and private collections in galleries across the country. Selections from Tom's permanent collection can be found at The Forbes Galleries in New York City and in Sampson Hall at Stetson University. He is a member of The Society of Illustrators and The Graphic Artists' Guild, in New York City, and The Atlanta Portrait Society in Georgia. Jim Shore graduated in 1977 from Stetson University with a Bachelor of Arts degree in History and a Juris Doctorate from Stetson University's College of Law in 1980. He is General Counsel for the Seminole Tribe of Florida, which is a 3,500-member, federally-recognized Indian tribe headquartered in Hollywood, Florida, with reservations totaling 90,000 acres in several parts of the state. Born in 1945 on what is now the Brighton Seminole Reservation, Jim, along with his two brothers and four sisters, grew up in the woods, where the family raised cattle. They lived under a traditional Seminole home, a chickee, made of cypress logs with thatched palmetto fronds for roofs. He was born blind in one eye and lost his remaining vision in an automobile accident in 1970. Jim's path to General Counsel of the Seminole Tribe of Florida is inspirational. The first member of the SeminoleTribe to become an attorney, Jim was admitted to the Florida Bar in 1981, and became Deputy General Counsel of the Tribe that same year. He took over as General Counsel one year later. In December 2005, Jim was awarded an honorary Doctor of Laws degree from Florida State University, and in October 2010, was inducted into the Stetson University College of Law Hall of Fame. Jim's lifelong commitment to improve the quality of life for the Seminole Tribe has been a powerful testament to his expertise and longevity in the legal field and to his passion for social justice. His skillful and tireless negotiations secured the Tribe's monumental acquisition of the Hard Rock hotel, restaurant and casino operations in more than 50 countries worldwide, including several in Florida. This resulted in the provision of an economic foundation for the Tribe's future housing, education, health care and environmental sustainability. Jim is active in the community and serves on the Board of Directors for the Joe DiMaggio Children's Hospital Foundation and the Memorial Foundation, an affiliate of the Memorial Healthcare System of Hollywood, Florida. Jane E. Eckert created one of the most successful tourism farms in North America and now helps members of the travel and agricultural industries tap into the agritourism market. A sixth-generation farmer's daughter, Jane grew up on her family's agritourism-focused apple orchard outside St. Louis, Missouri. She graduated from Stetson University in 1970 with a Bachelor of Business degree in Marketing. After a 15-year executive career in corporate marketing with such giants as Atlantic Richfield Oil Company, Jane decided to combine her marketing expertise and passion for agriculture as vice president of marketing for Eckert's Country Store and Farms. Through her innovative ideas and by working closely with agritourism groups, she helped develop the farm into one of metropolitan St. Louis' most popular entertainment and tourist destinations, attracting more than 500,000 guests annually. In 1994, the farm was named the Family Business of the Year for the Mississippi Valley. In 2001, Jane created Eckert AgriMarketing, a full-service marketing and consulting firm offering a variety of services to the tourism industry and agricultural operations. In recognition of those efforts, she received the outstanding leadership award in 2005 from the North American Farmers' Direct Marketing Association and was elected to the group's Hall of Fame in 2008. The same year, she was awarded the Agri Tourism Excellence Achievement Award at the World Agri Tourism Day conference in Pune, India. She is also founder and CEO of Rural Bounty, LLC, which promotes farms, ranches, wineries, community supported agriculture programs, farmers' markets and other businesses with rural roots. A recognized expert, Jane has helped thousands of tourism and agriculture professionals see the financial benefits of promoting agritourism through her speeches and workshops. She has been interviewed by hundreds of publications around the country, including U.S.A. Today, The New York Times and The Wall Street Journal. Active in all aspects of her profession, Jane is a past president of the St. Louis Attractions Association and The North American Farmers' Direct Marketing Association, and has served both the Missouri and the Kansas Agritourism Councils. She has been an active member of the Convention and Visitors Bureaus of both Missouri and Illinois. Lewis M. Kling is one of the nation's leading business executives with more than 35 years of experience leading manufacturing operations and holding key management positions in large global businesses. He currently is executive vice chairman of Flowserve Corporation, a $4 billion-plus New York Stock Exchange S&P 500 company and the recognized world leader in supplying flow control products to the power, oil, gas, chemical and other industries in more than 70 countries. He previously served as president, chief executive officer, and chief operating officer of the corporation. He also is a director of Eastman Chemical Company. In 2006, Lewis was the recipient of the highest honor given by the Chinese government to a foreign business leader, the Marco Polo Award. In 2009, he was chosen by a panel of business, academic and community leaders for an Ernst & Young Entrepreneur of the Year award in Southwest Area-North. Prior to joining Flowserve in 2004, Lewis was group president and corporate vice president of SPX Corporation, a Fortune 500 company, for seven years. He previously was president of Dielectric Communications, a division of General Signal Corporation, which was acquired by SPX in 1988. He also has held senior leadership positions with AlliedSignal Aerospace and Harris Corporation. While at AlliedSignal, in addition to serving as senior vice president and manager of Commercial Avionics Systems, he served as chairman of the board of the American Russian Integrated Avionics joint venture. He began his career in the Apollo Support Department at General Electric Company, where he served for 24 years in a number of management positions in programs, international marketing, engineering and manufacturing operations, simulation programs and design engineering. He was awarded a Master of Business Administration degree by Stetson University in 1971, after earning a Bachelor's degree in Electrical Engineering at Rensselaer Polytechnic Institute, Troy, New York. Michael H. Yeargan, a world-renowned set designer for theater, opera and ballet, is currently a professor (adjunct) of Stage Design at the Yale School of Drama and the resident designer for the Yale Repertory Theatre. From this academic base, he has fashioned a remarkable career. One of opera's most in-demand designers, Michael has worked with some of the world's best-known companies, including the Metropolitan Opera, New York City Opera, Lyric Opera of Chicago, San Francisco Opera, Dallas Opera, Houston Grand Opera, Welsh National Opera, Scottish Opera, Australian Opera, La Scala, and London's Royal Opera House. He has done set designs in London's West End and Canada's Stratford Festival. Michael also has worked extensively with America's regional theaters, the New York Shakespeare Festival, the American Repertory Theatre and the Dallas Theater Center. His career accomplishments have been recognized with numerous awards and nominations. The winner of two Tony Awards for Best Scenic Design in a Musical, he received his first in 2005 for The Light in the Piazza, which also earned him a Drama Desk Award and American Theatre Wing Henry Hewes Design Award. In 2006, he was nominated for a Tony Award for Best Scenic Design in a Play, and won the Drama Desk Award, for Awake and Sing! South Pacific brought him a Tony Award, Drama Desk Award, and an Outer Critics Circle Award nomination in 2008, and he again received a Tony nomination in 2009 for Joe Turner's Come and Gone. Michael graduated from Stetson University in 1969 with a Bachelor of Fine Arts degree in Theatre and Speech. During his time at Stetson University, he participated in many Stover Theatre productions, both as an actor and a set-builder. He spent a year studying in Spain before being accepted at the Yale School of Drama, where he earned a Master of Fine Arts degree in 1973. Only a year after his graduation, he joined the faculty at Yale, where he continues to teach.